â€œKeep behind me. There’s no sense in getting killed by a plant.â€ Â Hmm, a killer plant, you say? Maneater of Hydra (1967)? We already did that in episode 2. The Thing from Another World (1951)? Nope, that was episode 7. Invasion of the Body Snatchers (1956)? Wrong again. That was episode 24. Little Shop of Horrors (1960)? Huh-uh. We havenâ€™t done that one yet, but thatâ€™s not a bad idea. 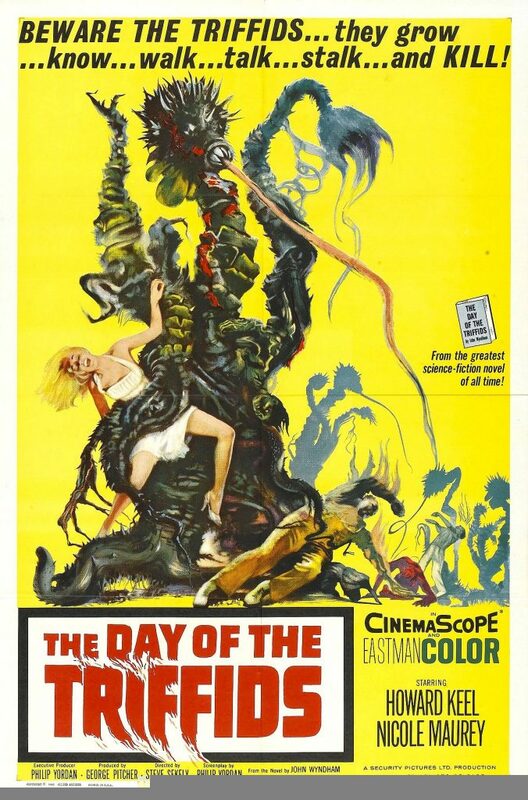 No, this episodeâ€™s film is none other than The Day of the Triffids (1963), based on John Wyndhamâ€™s classic, 1951 science fiction novel of the same name. Join Chad Hunt and Jeff Mohr, along with guest host Adam Thomas, as we blindly tiptoe through the triffids with you. The first thing your faithful Grue Crew learned is the writer credited with The Day of the Triffids did none of the writing. Philip Yordan, listed as the writer on screen, was really a front for the actual screenwriter, blacklisted Bernard Gordon. The director of record is Steve Sekely, who did do the initial direction. The finished product was deemed too short, however, and Freddie Francis was brought in to direct a parallel storyline taking place entirely with a couple in a lighthouse. The Day of the Triffids opens with Bill Masen (Howard Keel), blinded in an accident, about to get his bandages removed. At the same time, the rest of the world is experiencing a blindingly spectacular meteor shower. No really. Everyone who looks at it, which is nearly everyone, is blinded. The meteor shower also brings some magic which causes the walking, stalking, man-eating plants known as triffids to rapidly grow to a height of 8-10 feet. It turns out that triffids breed faster than rabbits and grow faster than weeds, and begin to feed on the blind and helpless humans. Bill, who can see (remember the bandages), heads out through the devastated city and across the countryside. On his way, he encounters several other sighted people: Karen (Janina Faye), a young girl who escapes a train crash; Christine Durrant (Nicole Maurey), a French woman who owns a large chateau in which she is housing rescued blind children and adults; Mr. Coker (Mervyn Johns), an elderly man who is helping Miss Durrant; and a band of escaped convicts. 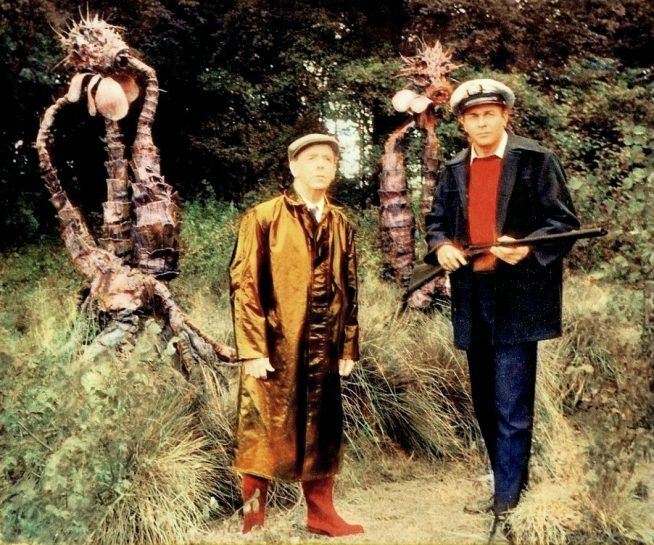 None of these sighted people meet the also sighted Karen and Tom Godwin (Janette Scott and Kieron Moore) who are the only characters in the added lighthouse scenes. Adam canâ€™t stop bringing up how a few of the characters really abandon the blind people at the home and leave them at the mercy of the sighted convicts. He means, theyâ€™re really, really abandoned! Jeff once again extols the virtues of a John Wyndham novel and is amazed at what a good cliff diver Howard Keel is. Chad loves the scenes in the lighthouse and the relationship between the Goodwins. 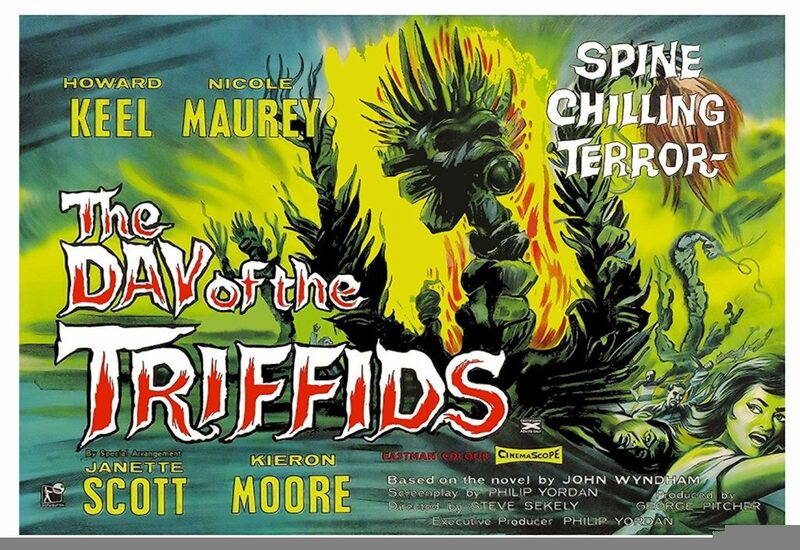 Rest assured, the three hosts consider The Day of the Triffids to be a bona fide genre classic, worthy of a Decades of Horror: The Classic Era treatment. Seriously, who hasnâ€™t heard of triffids? We plan to release a new episode every other week. 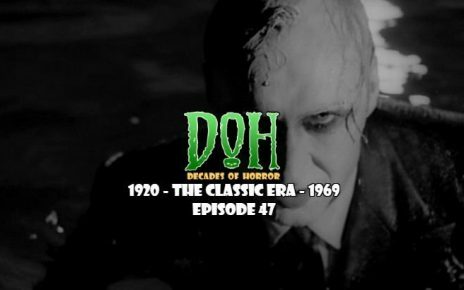 The next episode in our very flexible schedule is Dead of Night (1945), selected by Jeff Mohr.